It is replaced by the Datamax-O'Neil M-4206. For moderate volume label printing applications demanding versatility, quality and economy. The Allegro 2 printer is designed to produce quality thermal labels on-demand in low to mid-range volumes. It provides an outstanding print quality and performance at an economical price. 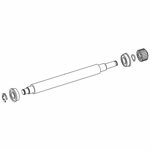 The Allegro 2 has a print speed of 3 inches per second (76mm) and can accommodate up to a standard 8 inch (203mm) outside diameter roll of media and labels. The center plate is welded to the base plate providing a strong construction for a printer in this price range. The printer has an economical corrosion proof and abrasion resistant black powder paint. Additionally a new rugged printhead carriage and locking mechanism built into the Allegro 2 offers a more user-friendly method for loading media and labels. 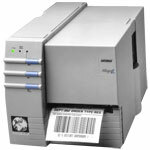 The Allegro 2 printer is Datamax's value-priced printer designed to produce high quality thermal labels on-demand in low to mid-range volumes. TheAllegro 2 printer provides the same outstanding print quality and performance as the original Allegro printer at the same economical price. TheAllegro 2 includes a 50 percent increase in print speed to 3 inches (76mm) per second. The printer accommodates up to a standard 8 inch (203mm) outside diameter roll of media and labels. The center plate is welded to the base plate, providing the strongest construction for a printer in this price range. An economical, corrosion proof and abrasion resistant black powder paint has replaced the internal anodized metal. 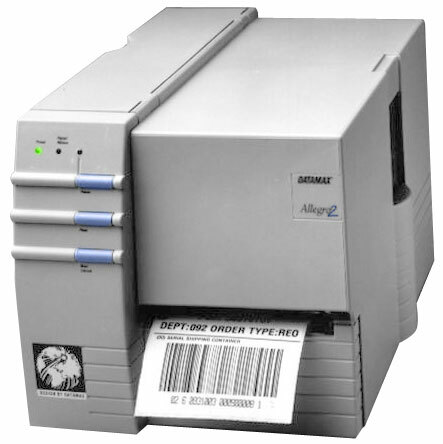 A new rugged printhead carriage and locking mechanism built into the Allegro 2 offers a more user friendly method for loading media and labels.Suggested applications for theAllegro 2 printer include shipping labels, retail labeling, point-of-sale, prescription labeling, laboratory sample tracking, and document tracking.